As you finalize your seed order for 2015, here are things to discuss with your seed representative. 1. Hybrid positioning is extremely important in maximizing yields. There is no perfect hybrid that performs at peak performance across all growing conditions. Each hybrid responds differently to different growing conditions. We cannot control or accurately predict the weather for the 2015 growing year, but you can position hybrids based on the things you know about your fields and their history. 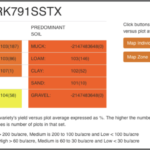 Have your soil maps, soil tests, and yield maps handy. It is also necessary to discuss your density intentions, previous crop fertility intentions, past disease issues, and any diagnostic symptoms that appeared last season or in recent seasons. Only then can you position hybrids by field and increase your odds of maximizing the yield potential of each field. Perform the same assessment for the need for traits. Carefully consider “bred in” multiple modes of action for controlling above and below-ground pests. This is the most consistent and best insurance for protecting your crop from yield-robbing insects. 2. Don’t base your buying decisions on one year of product performance in your local area. Just think about how different 2014 was from 2013 and 2012. It is likely 2015 will be different also. Check out independent, third party data but keep in mind that it is still one year data and grown under better than average field conditions and fertility levels. Therefore, it is very important to plant a package of products that have performed well across years and numerous growing conditions. As product managers, we have advanced products that have had hundreds of locations of testing across multiple years and a wide variety of growing environments. A package of 3 or 4 products that offers diversity for pollinating dates as well as genetic background would spread your risk and minimize your vulnerability to unforeseen and uncontrollable yield reducing environments. 3. Take advantage of progress in genetic gain for yield in new products. Advances in breeding methods and testing have increased the rate of genetic gain that breeders are making. New products tend not only to be higher in yield potential, but more consistent in performance at various yield levels. Discuss with your seed representative as to which new products would be right for your operation. Does the guy giving me this “deal” or “free seed” know my operation and my fields like my current dealer? Can he sit down and position theses products the way my current dealer does? Does the new guy really have the product knowledge and information to maximize my total revenue? I have seen many farmers that are happy with their bargain seed before planting but then regret their decisions when harvest comes around due to huge yield loss. Secure the best hybrids available, position them correctly, feed them well, and you will have peace of mind that you are doing the very best you can to maximize your returns. Should you have any questions about finalizing your seed order, just ask. We would be glad to offer our advice – it’s free.